1. 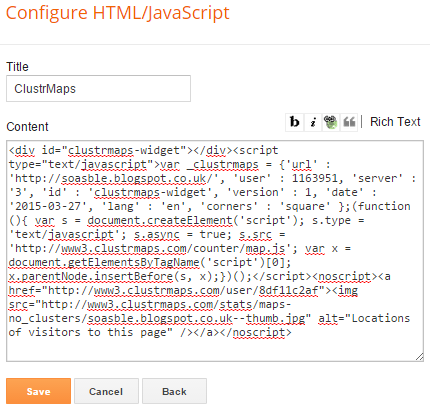 Navigate to clustermaps.com and create an account using the options in top right hand side by inserting your blog or website address along with your email address. Then click the Make my map button to trigger the Activate your account email. 2. Once you have activated your account you will receive Your first email, navigate to http://clustrmaps.com/admin/action.php (link provided in the email) and use the login credentials emailed to you then click the Log in button. You are then taken to the landing page for ClustrMaps where you can change your personal detail or password. 3. The first tab entitled HTML code displays the HTML code for the ClustrMaps associated with your URL, which you can use to create a widget on your blog or website. Start by selecting a style for your ClustrMaps and then copying the HTML code. 4. 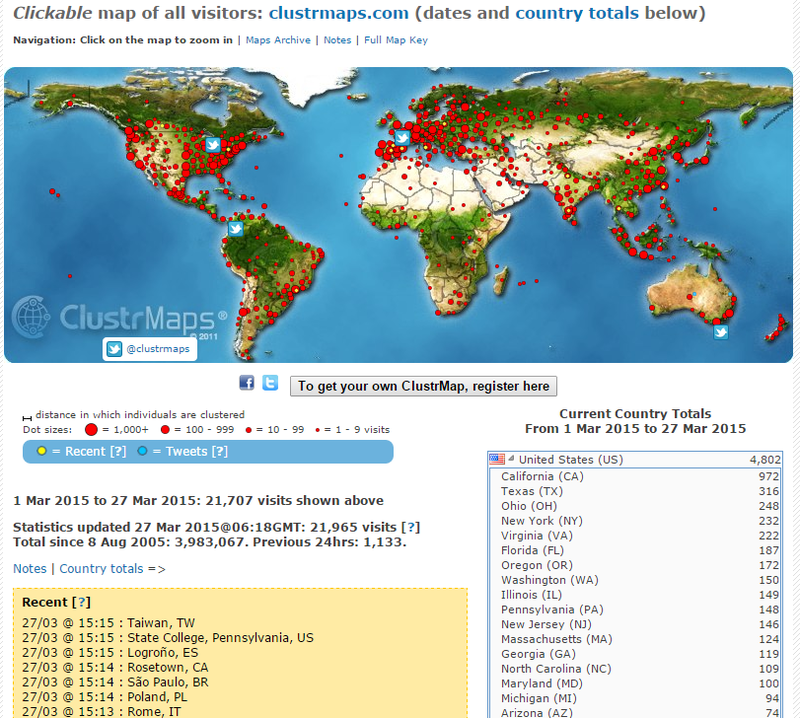 For this example I will use Google’s Blogger to demonstrate how you can insert a ClustrMaps into your blog. 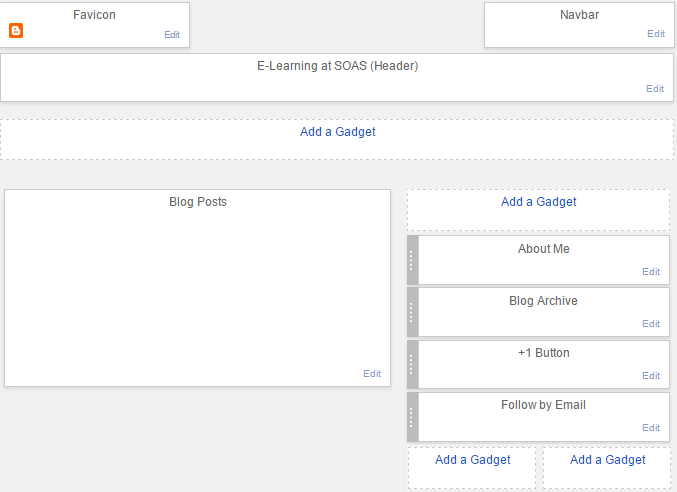 Once logged into Blogger select Layout from the left hand set of options. You will then see the layout of your blog page, click on Add a Gadget on where you would like the ClustrMaps to be situated on the page. Another pop up window will appear where you need to give your new HTML block a title and then paste the HTML code you copied earlier into the content box and click the Save button. You will now see a new block has appeared in your blog page layout and if you are happy with the placement of the block click the Save arrangement button (top right). 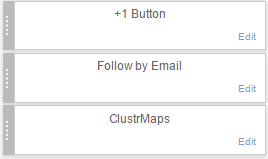 The ClustrMaps widget will now be live on your Blogger page and dots will start appear after 24 hours on the map. 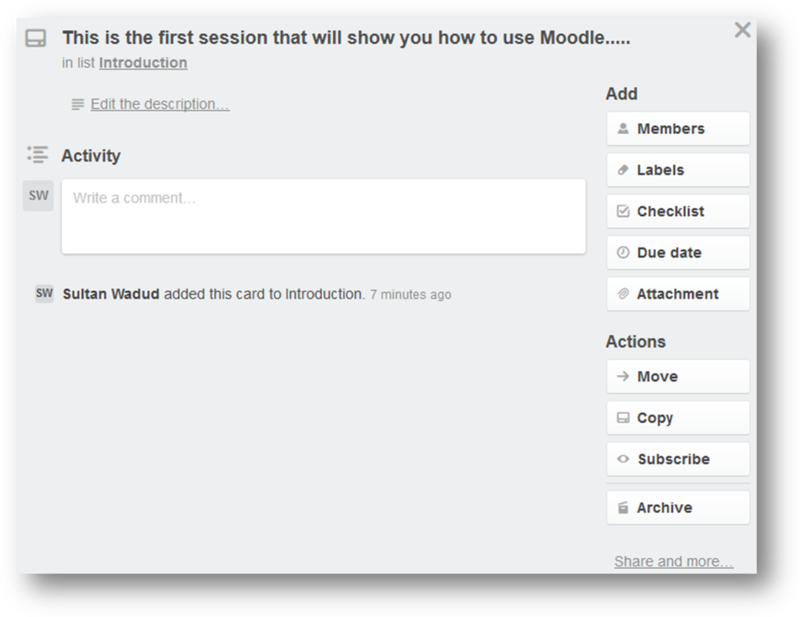 I am a big fan of interactive timelines to enhance Moodle pages to make them visually pleasing. I had previously posted a blog on JS Timeline which relied on Google Sheets to produce the timeline however it was not as straight forward and easy to use as one would have hoped for. This week I have stumbled upon Capzles, which is a social networking site that allows you to share “moments” using pictures, video clips, audio tracks and text in a timeline format. These moments can be viewed individually, or all of the moments can be viewed in progression. One of the key advantages of Capzles over similar tools available online is that each point along the timeline can contain multiple multimedia objects to provide a much richer user experience than the usual linear timelines that we have seen. The ability to leave comments on content is a great option that allows viewers to share their opinions or ask questions about the content they have viewed. Navigate to the Capzles home page (http://www.Capzles.com) and click the Join Now, It’s Free button which is situated in the top right hand side. 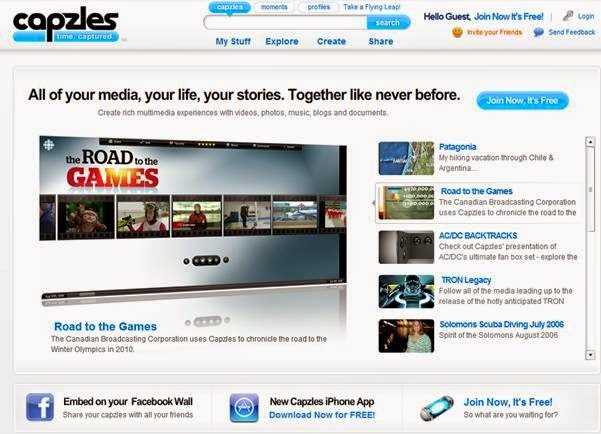 Capzles Logo (top left corner) – if you need to return to the home page simply click the logo at any time. My Stuff – after you have created your account, you will be able to make changes to your profile, read and compose messages, add friends, view your favourite Capzles and moments. Create – use this option to build a new Capzle or edit an existing one. Share - share or invite your friends to join Capzles. 1. Create a new Capzle – From the home page select New Capzle from the Create menu. 2. Add Title & Description – give your Capzle a title and description and click the check box (under Description) if you would like the title to appear inside the Capzle. Beneath those fields you have the option to select the font, size, style, and colour of the Capzle title. 3. 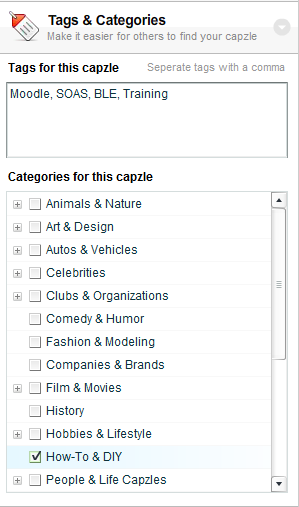 Tags & Categories – add tags to your Capzle or select a relevant one from the Categories for this Capzle. If you are creating your own tags remember to use a comma to separate them. 4. 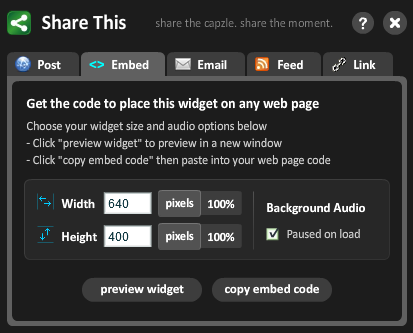 Add Content – From this option you can upload images, videos, audio, and text. A) Upload directly onto my timeline – use this option if you want your images, videos and text to appear as one Moment in your timeline. 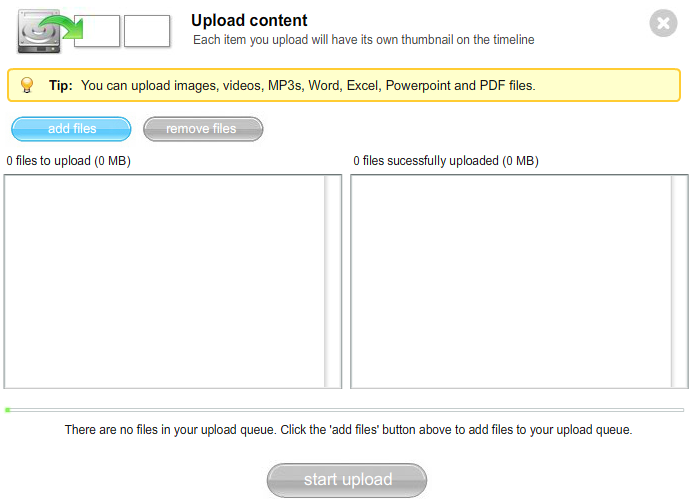 Click Add files to select the files you wish to insert into your timeline and then click the start upload button. Once the upload is complete the content box will close automatically and your Capzle will be open in edit mode. Each file is now moment in your timeline which has arranged them in chronological order of when they were uploaded. 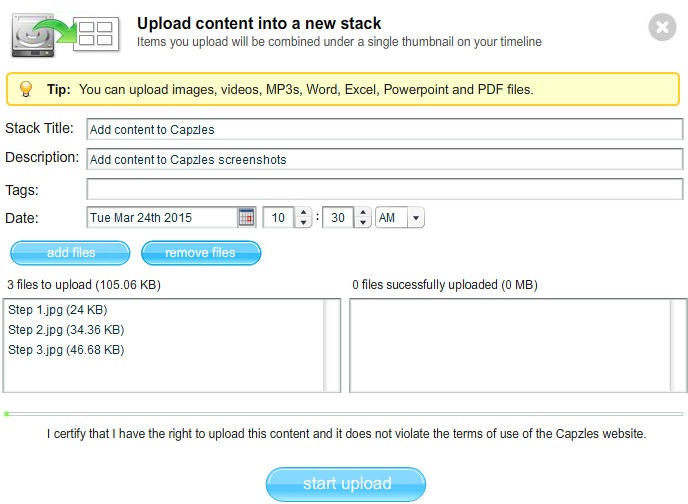 B) Upload content into a new stack – this is a useful option to utilise if you wish to insert multiple files into one moment. Similar to the Upload content option however this time you are required to provide a title, description and tags. 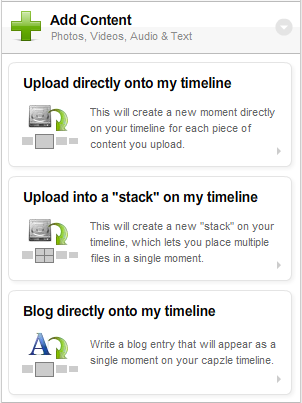 C) Blog directly onto my timeline - this option allows you to add text to your Capzle in the form of a blog. Add a blog title, description, tags and text, which either written directly into the text box or copy and paste in html code. Once completed click done button and then you will be able to see the new entry in your Capzle timeline. 5. 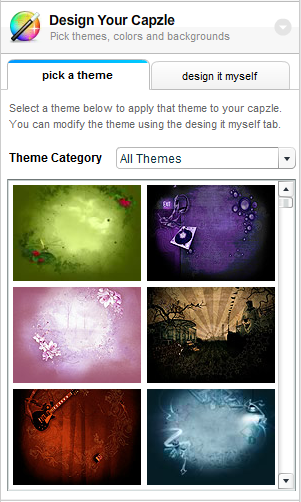 Design Your Capzle - use this option to change the theme, colour and the background of your Capzle. To make the change simply pick a theme from the tiled preview options or alternatively design a theme yourself by uploading an image. 6. 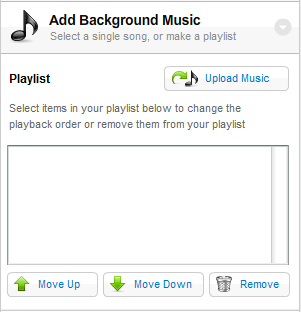 Add Background Music - use this you can add music to your Capzle by selecting this option. Start by clicking on the Upload Music button. 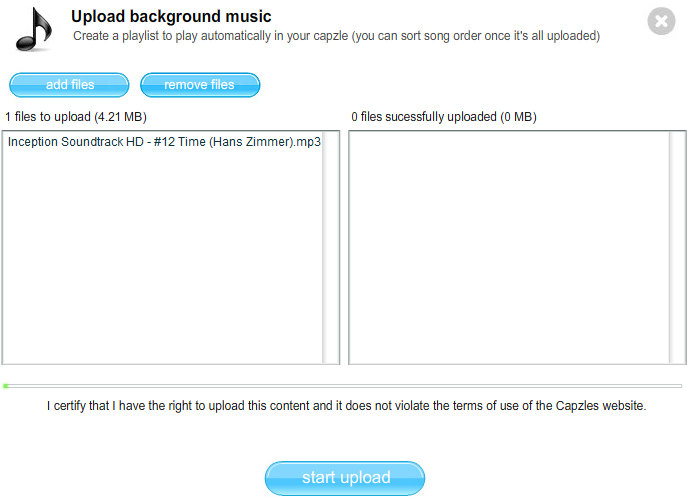 Then add the file(s) to wish to upload by clicking on add files and then selecting the audio files you want to upload. By uploading more than one file you can create a playlist for your timeline. Any music that you do add to your timeline will continuously loop whilst viewing. Use the Move up or Move Down buttons to change the order in which the music is played on your timeline. If you wish to delete a sound file from your timeline simply click on the sound file in the list and then click the Remove button. 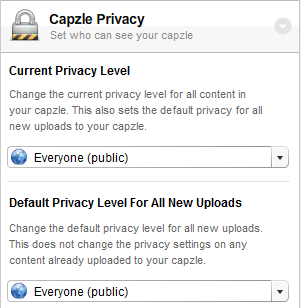 Nobody - your Capzle it is private and no one else can view it. There is also another drop down menu (Default Privacy for All New Uploads) which allows you to automatically specify what restrictions you wish to place every time you upload new content. 8. 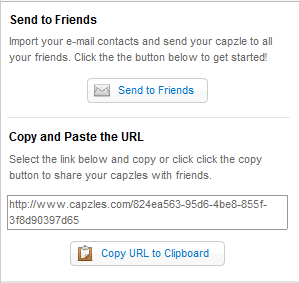 Share Your Capzle - this is a useful If you would like to share the link to your Capzle with your friends. When viewing your timeline in normal view, ie not editing mode click the Share button from the options along the top. 9. 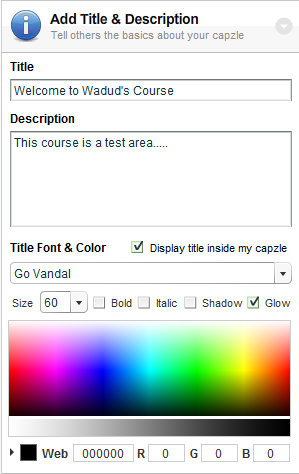 Embed your Capzles - From the pop up window click the Embed tab and then click the copy embed code, which you can then use to add to your website or Moodle course by adding a label and using the HTML editor option. 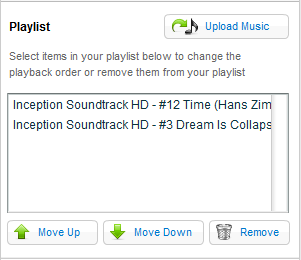 I found Capzles very well designed and easy to use with some great options over other timeline tools that are available online, such as ability leave comments, to stack more than one item to a moment or ability to add audio. It is a fun and intuitive tool that can be utilised for digital storytelling and presentations. 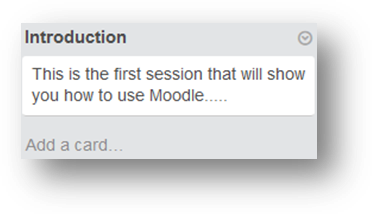 The tool could also be used to organise a Moodle course by presenting all the course materials over the period of one Capzle timeline. 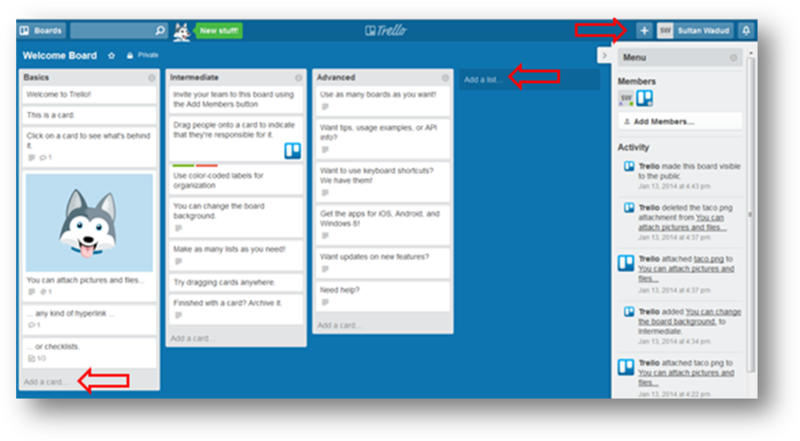 Trello is a free collaboration tool that organises projects into boards. Trello allows you can view what work is in progress, who is working on what project, and which projects are in process. In addition Trello allows users to attach files, add checklists, assign users and due dates, search, add labels and much more. As well as facilitating the life cycle of a project Trello can be utilised for organising to-do-lists. Boards - A board represents a project. Whether you are redesigning a kitchen or launching a new website, a Trello board is the place to organize your tasks on lists and collaborate with your team of friends, family, and colleagues. Lists - Lists keep cards organized in their various stages of progress. They can be used to create a workflow, or act as a repository of ideas. Cards can be moved across lists as tasks go from start to finish. Cards - The fundamental unit of a board is a card. Cards are used to represent tasks and ideas: something that needs to get done, like a grocery list, or to be remembered, like a book recommendation. There is no limit to the amount of cards you can add to a board. 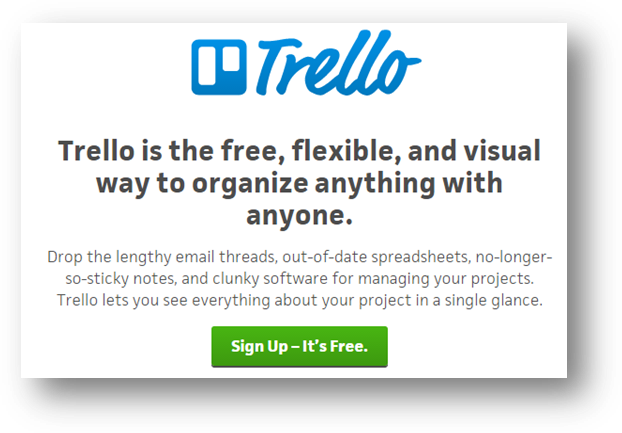 Navigate to https://trello.com and click on the Sign Up-It’s Free button. If you have a Google Account then you can use this to create your Trello account. The Welcome board is a good starting point for you to see pre set-up lists and cards as well as doing some exercises to familiarise with Trello. Boards could represent a variety of things such as product, project, resource, or organisational structure that is under continuous development which in effect works as a collection of lists, and each list contain a series of cards. There are no limitations places on the numbers of boards, lists or cards that you can create. You can see in the screenshot below to create a new card, list or board click on the corresponding button. 2. To create your first board you can either click on the plus icon (along the top) or click the Create new board…. button. Give your Board a name and click the Create button. 3. Next add lists to your board by clicking the Add a list… button. Click on the Add a card option available in each list to insert a description and then click the Add button to save. Edit the description - option allows you to add further information about your card, which could also include a link to a website. Activity and comments - allow you to communicate with other members of the team about a particular task. By using the @ and the name of the member you can quickly notify them within a comment. These sections work similar to a timeline in that they provide a useful way to maintain a log of all the actions that have taken place for a task (card) and what progress has been made. Members – assign members to cards or add them so they are just kept informed. Labels – allow you to set a colour theme for each card, which is useful if you like to filter using visualisations. Checklists – creates subtasks that need completing for the card. Due date – set a date by which the task within the card must be completed by. Attachments – insert files to the card from your computer, Google Drive, Dropbox, Box, OneDrive or a webpage link for the file. Move – allows you to relocate a card to a new board or list. Subscribe – provides a notification service for board members of any actions that have taken place. Trello has a lot more to offer than what was covered in this blog, such as creating cards via email, viewing boards as a calendar, customising the aesthetics, and integrating Dropbox or Google Drive account. Therefore would recommend that you explore their website in more detail as well reading the how to guides which can be found here. Last week I attended a conference on Games, gamification & games based learning in London and during one of the presentations we were introduced to Kahoot which instantly caught my eye. Everyone was asked to get into groups of two and ensure they had access to a mobile device. A pin number to the quiz was displayed on screen and within seconds of entering that code into my mobile we had joined the quiz and our team name was displayed on the screen along with the fellow participants. Questions were then projected on screen and each group had to answer the questions by pressing on the corresponding coloured tile using their mobile devices. Within a matter of minutes the whole conference room engaged and you could see that competitiveness come out in some of the groups who wanted to be the winner of the quiz. It was a simple but effective demonstration of how one could apply this tool within a classroom or lecture environment to add some interactivity and engagement with students in a fun way whilst ensuring something had been learnt. 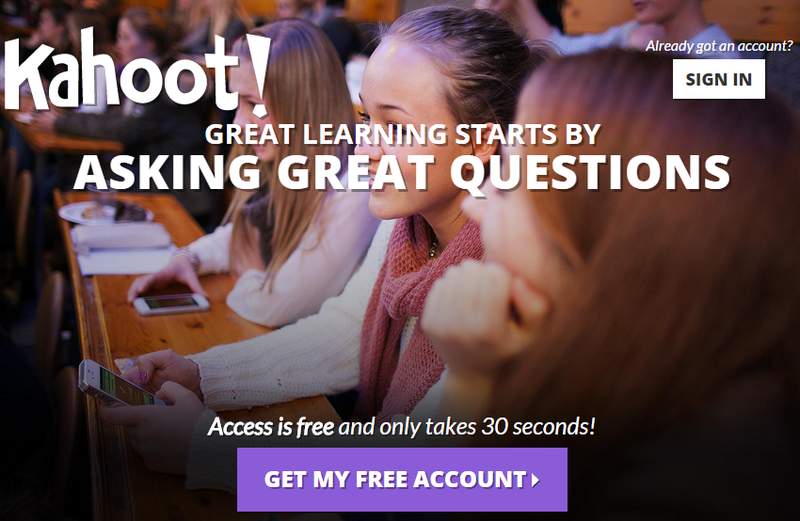 Kahoot can be described as a collection of questions which can be created by anyone, which are then asked in real-time, to an unlimited number of participants, resulting in a social, fun and game-like learning environment. It also provides an excellent example of how BYOD (bring your own device) environment can be implemented effectively within a classroom. 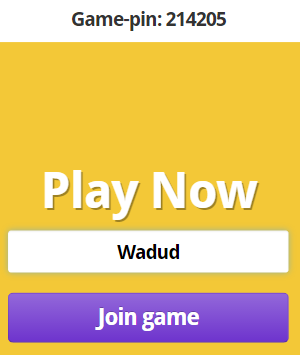 Kahoot consists of multiple choice questions - as a quiz, discussion or survey - in any topic, language or ability. The questions are projected at the front of the room and can be played by the whole class individually or in groups in real-time whereby the answer the questions on their computers, mobiles or tablets. 1. 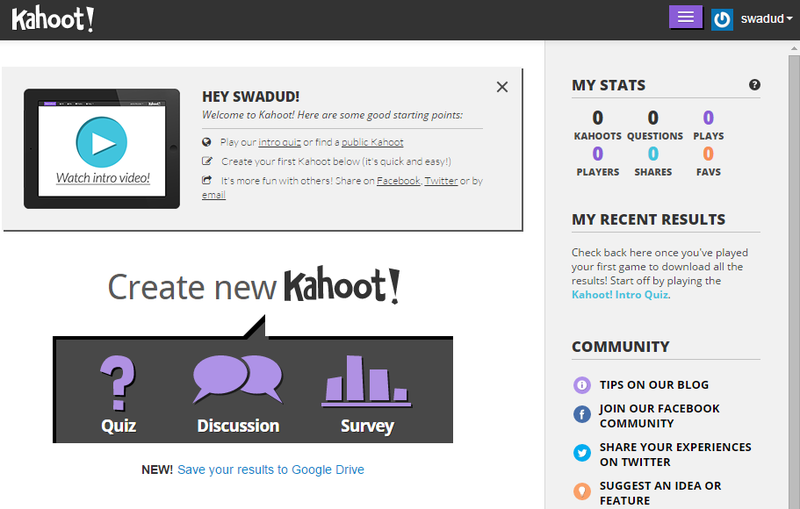 Create your Kahoot account – visit getkahoot.com and click on the GET MY FREE ACCOUNT button. Enter your details and once completed click ‘CREATE ACCOUNT’ button after which you will be taken to the landing page. 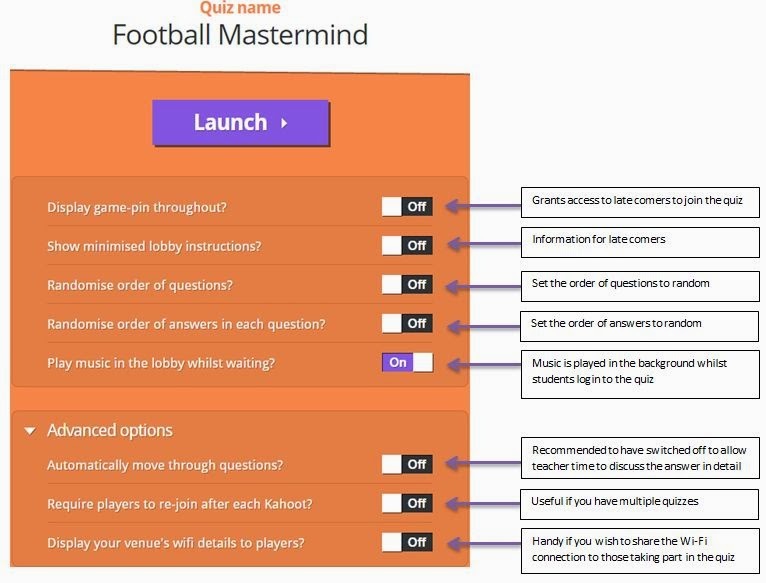 Quizzes – allows timed responses and a points system to create a competitive atmosphere. Surveys – are similar to quizzes without the point based system, which is useful for obtaining feedback. Discussions – works with a single question minus the competitive elements associated with quizzes and provides a great option to employ to start a discussion. For this example we will select quiz. 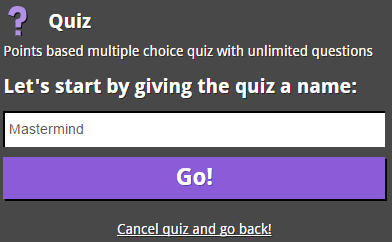 So to begin click on the quiz icon, enter a name when prompted and then click the Go! button. I would recommend to keep quizzes short, around 10 would be ideal so your quiz remains focused. You can also specify how long you wish to give the class to answer your each question, the default is 30 seconds. Depending on the complexity of the content or question you may offer 10 seconds for quick-fire memory test or 120 seconds where students may be required to calculate answers. Kahoot also allows images or YouTube videos to be embedded into each question, which can help focus students’ attention even more. You can either drag and drop images from your computer or click the Choose file button to select an upload your image. 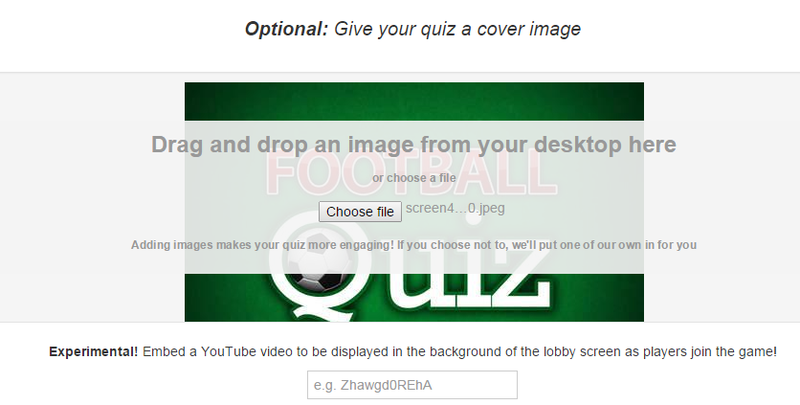 Click on the Video (Experimental) tab to view the options to embed a YouTube video into your quiz. Next you need to enter the possible answers to your question, by default you have four slots available however you reduce the number of possible answers if you wish by clicking on the button. To select the correct answer(s) click on the red Incorrect button to change it to a green Correct button. To add more questions to the quiz click the +Add Question button towards the bottom of the page and follow the above steps again. After you have created your entire questions click on Save & continue bottom right green button. 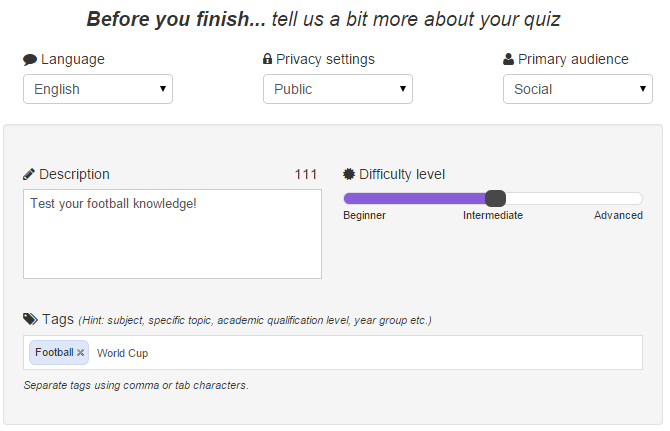 You will then be able to see all the questions that you have created for your quiz. You can rearrange the questions by simply holding down left click and dragging it to the new location. Once you are happy with the order of your questions click on Save & continue button. Complete the settings and description for your quiz. By filling in the details you can help other members discover your quiz (if made public). Finally select an image that you wish to be displayed as your quiz cover. You can also include a YouTube video to be played in the background whilst the quiz is taking place. Click the Done button once you have finished. You can now either test your quiz by clicking Preview, if you wish to make any amendments click on the Edit button and if you are all set to start the quiz then click on Play now button. The final stage is to provide instructions to inform the class to navigate to www.kahoot.it and enter the pin that is displayed on the lobby page. The number of players will increase as each person enters the game-pin into their computer or mobile device. 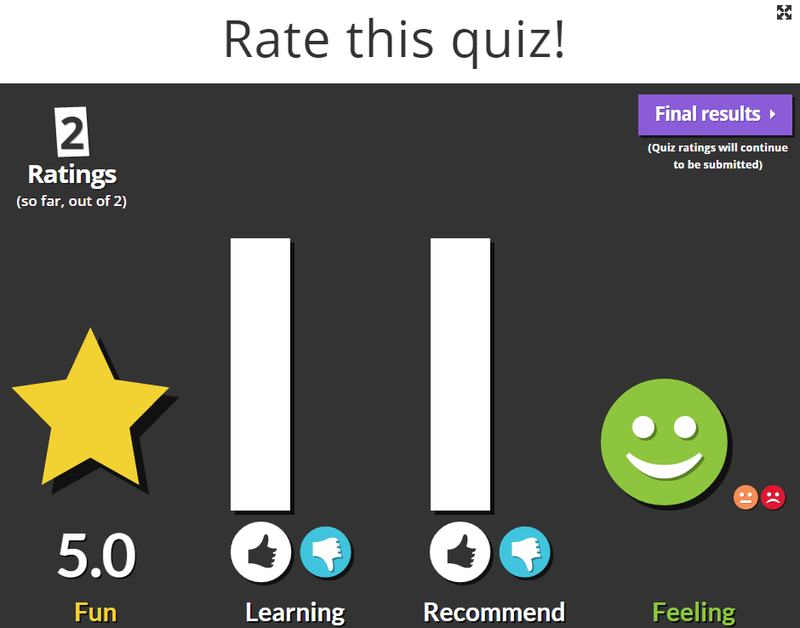 By clicking the Feedback & results button all the participants will be asked to rate if they had fun, whether they felt they learnt something and if they would make a recommendation. 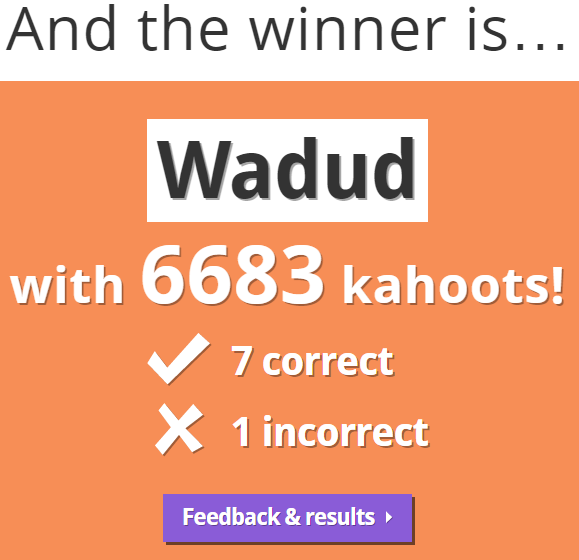 Kahoot is effective tool to make learning fun by employing fun and competitiveness into the classroom. Not only does facilitate student engagement through the use of quizzes and discussion on what they have learnt but through the use of survey a teacher can quickly obtain data. It is vital for anyone considering using Kahoot to take into account that participants will need access to an internet enabled device in order to take part.